Once you've learned a piece all the way through, it's time to think about your first performance. Download Total Guitar issue 230 for the accompanying tab and explanation - available in the UK and, digitally, worldwide via Apple Newsstand and Zinio (http://www.zinio.com) from 9 July 2012. 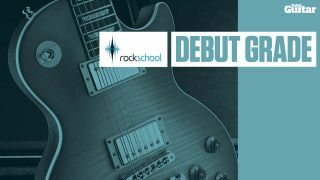 You'll find the full track, backing track and tab for Rockschool's Debut Grade piece, 101, below. Clicking on the links will stream the audio/open the tab. Alternatively, you can download them all by right-clicking and choosing 'save as' or 'save target as', depending on your choice of browser.